First of all, let me tell you the good news: You won’t compete with ten other job applicants in your interview. Electrical engineering does not belong to the popular fields of study, and companies often struggle to hire new engineers. The demand often exceeds the supply in this branch of a labor market. This means that the interviews won’t be extremely difficult, and if they see some potential in you, and if you manage to come up with decent interview answers, they will hire you for this job. At least most of the time they will. They do not have many options at the end of the day. There aren’t ten or twenty other applicants waiting in the line, just like in management or finance interviews. Let’s have a look at some questions you may deal with. We can split them into three groups – personal, behavioral, and technical. Technical questions – will you get them? Many companies won’t use technical questions at all, for two reasons. They trust in the educational system (or in your list of previous working experience), and do not doubt your ability to handle the job. The person leading an interview with you may have minimal technical skills, and won’t be able to interpret your answers to technical questions. Therefor they opt for not asking them at all. Let’s have a look now at each group of questions. Why do you want to work as an electrical engineer? Try to refer to the future, not to the past. Saying that you want the job becasue you earned a degree from electrical engineering would indicate a must, not a desire. Say them that you have passion for designing and developing electrical systems, that you enjoy doing what engineers do in their jobs. Why do you want to work for us? Why not one of our competitors? Engineers can choose. Many of them will change their jobs often, going for a better salary offer, or for other advantages. Grass is always greener somewhere else. In your interview, however, you should try to convince them that you genuinely want to work for them. You can say that you like the products they design, that the field interests you greatly. You can also point out a motivating working environment, or other things that attracted you to their offer–such a strong brand, career growth opportunities, and other. Why did you leave your last job?/Why do you plan to leave your present job? Job hopping is a common problem in this field. Try to be honest, but do not say that you plan to leave, just becasue the new employment will pay better. Say rather that you want to design systems in a new field, that their job description looks way more interesting. 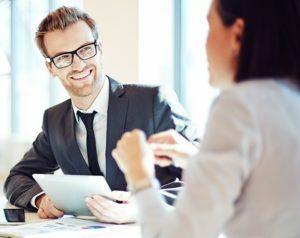 You can even point out some problems you faced in your previous job, though I would not suggest talking badly about your former boss or colleagues–such a talk just doesn’t leave a good impression, and nobody wants to hire an engineer who’d have conflicts with other staff members on a daily basis. What motivates you the most in this job? What really motivates us, and what we should refer to in an interview, are often two different things. Nevertheless, you can talk about enjoying the job, trying to come up with interesting designs, having an impact on the final product. Or you can be honest and say that you enjoy your life outside of work, and the salary in this profession allows you to be on the easy street. What characterize a good boss/colleague from your point of view? Inquiring about various situations that you experienced in your former engineering jobs, or talking about hypothetical scenarios (if you apply for your first job), hiring managers try to learn more about your attitude to work and to your colleagues. This helps them to understand whether it will be easy to work with you, whether it will be a pleasure (or pain) to have you in their team. Talk about a time when you struggled to progress in your work (with one of your designs). Engineering is not the profession for the impatient. You have for sure experienced problems. Maybe you didn’t finish the design, or fell behind schedule, or needed to consult other people to be able to continue your work. Feel free to talk about these situations in the interview. Hiring managers look for engineers who are ready to admit that they are struggling. They want to hire engineers that aren’t too proud to consult their colleagues, and seek help. Describe a time when you struggled with motivation in job. This can be one of the reasons why you are seeking a new job. Talk openly about your crisis of motivation. Show them that you are human, that you experience ups and downs, just like everyone else. But you should ensure them that you keep your goals on your mind, that you see the bigger picture, and that all these things help you to deal with the crisis of motivation. Describe a time when you struggled to communicate something to your boss, colleague, or to a customer. How did you manage to get your message over? Technician talking to a manager–will they understand each other? Many times they will not, and company will pay the price. Try to ensure the hiring managers that you are willing to go out of your comfort zone, and adjust your language to the level of technical skills of the person you talk to. You can elaborate on your answer, saying how you used practical demonstrations, charts and pictures, to get your message over. Note: In my experience, many engineers struggle with answers to behavioral questions. If you are also doubting your ability to come up with a great answer to each of these questions, have a look at our Interview Success Package. 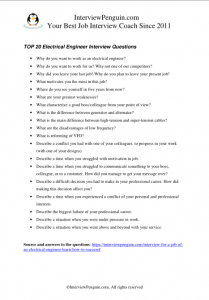 Great answers to all difficult behavioral questions (including answers for people who apply for their very first job) will make your life much easier in your electrical engineering interview. Whether they will ask you any technical questions is also a question. If an HR generalist leads the interview with you (or anyone else who lacks real knowledge of engineering), they may avoid asking technical questions. The reason is simple: they will now know how to interpret your answers. They will not be able to tell a good answer from a bad one. What is the difference between generator and alternator? What is the main difference between high-tension and super-tension cables? What are the disadvantages of low frequency? What is reforming of VFD? Some companies opt for testing your engineering skills directly in an interview, with a practical test. This test has typically one of two forms. The first form consists in showing you an existing design of a power system. They may ask you to simply explain the design. But they may also include some defects/mistakes in the design (on purpose) and ask you to identify the mistakes. Second form is proposing a particular problem (typically related to their field of business), and asking you how you’d approach the problem. Interview for electrical engineer job belongs to difficult interviews. You will deal with plenty of personal and behavioral questions, and you will often have to cope also with technical questions. On the other hand, you won’t compete with many other people for this job. Speaking honestly, the hiring managers will hope that you will come up with good answers to their questions. They want to hire someone at the end of the day, and they may not have many opportunities to do it. Interview Success Package – Great answers to thirty most common personal and behavioral interview questions. Get ready for the big day in less than two hours!